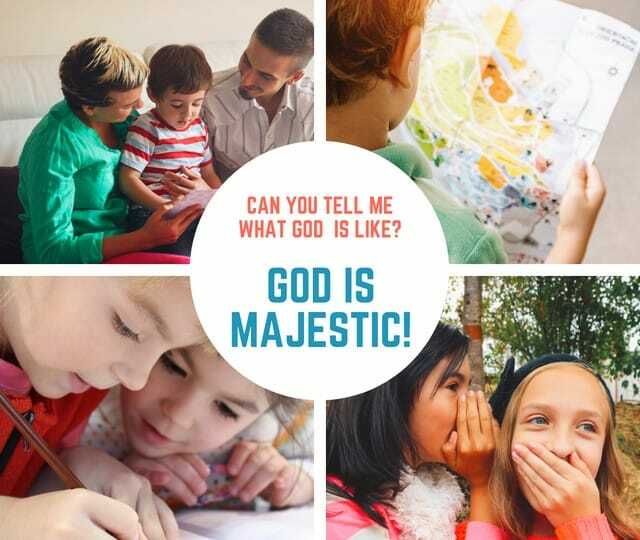 In this lesson from Matthew 21:1-11, children will learn that God is Majestic. This is lesson 22 of 42 in our study on the Attributes of God called “Can you tell me what God is like?” Visit the series index to view all the lessons and get more ideas for using this curriculum in your children’s ministry. Bibles, previous attribute of God posters, a large piece of paper with the words GOD IS MAJESTIC written on it, key verse (Psalm 8:9) printed on a piece of paper, blank paper and markers or colored pencils for each child in the group, pages with the truths about God on the top and the definition on the bottom that have been cut in half for the review activity. Ask if anyone can remember the truths we’ve learned so far. Play a quick review game where you hand each child 1 or 2 of the review pages that you’ve prepared (either attributes of God or definitions). Then, have kids race to find who has their match and put the pieces together. Then, ask the kids what the word majesty makes them think of. Once someone says it makes them think of a king, ask then to describe a king. Some of the things to include in the description are – kings are royal or regal or grand, kings are powerful, kings are rich, kings are in control, kings reign over their people or their country, etc. Have one of the kids read 2 Samuel 7:16. In this verse God is promising David that he would always have a man (or a descendant) on the throne. Explain to the kids that God’s people used this promise to keep them going as they waited for the Messiah. The Messiah would be the One who would come to rescue them. By the time Jesus was on the scene, the people were under the rule of Rome and they no longer had a king on David’s throne. They were waiting for a king to come riding triumphantly into town on a white horse and rescue them from Roman rule and reign on David’s throne. Some people started to think that maybe Jesus was the Messiah, but what He was doing just didn’t fit with their idea of what the Messiah would be. And then…. Jesus are His disciples were traveling toward Jerusalem. Jesus knew what would happen (he would die) in Jerusalem and was heading there with full resolve because this was why He had come to earth in the first place. Jesus sent His disciples ahead of Him to get a donkey and a donkey colt (baby) and bring them to Him. All of this happened to fulfill a prophesy about the messiah…. read verse 5 & Zechariah 9:9. Jesus was reminding them that their Promised King would come to them on a donkey. He was teaching His disciples and the people around Him that He was the King, He was the Messiah, He was the One they were waiting for to come and rescue them. As you read Matthew 21:6-11 have the kids in the group act like people in the crowd and imagine Jesus coming riding into town on a donkey. Then read Psalm 118:25-29. Look back at what the people were saying to Jesus in Matthew 21:9 and notice that the people were basically quoting these verses. Explain that the word “Hosanna” basically means, Lord rescue us or lord save us. On the surface, it would seem that the people were beginning to understand who Jesus is and were worshipping Him as their rightful king, but if you read on in the next few chapters of Matthew you’ll see that they still didn’t know and understand who He is. EXPLAIN: Remind the children in your group of a few weeks ago when we learned that God is the King of kings and Lord of lords and how that reminds us that He is king over all other kings. Then, make the connection with the story today and how the people were waiting for a king to come and rescue them from Rome, but instead the KING (Jesus) came and rescued them from sin and death. Since motions & actions help kids remember, choose an action for MAJESTIC. A good motion might be to bow like you’re before a king. Read the memory verse – Psalm 8:9. Work together as a group to make up motions for the verse. Say the verse together a few times using the motions. In our story, it seemed like the people were beginning to understand who Jesus is and that they were crying out to Him for salvation. But, Jesus knew that the same voices who cried to Him in worship on this day would only a few days later cry out for Him to be crucified. You see, Jesus wasn’t who the people thought they needed. They thought they needed an earthly king and an earthly rescue, but really they needed so much more. They needed the same thing that we all need. They needed the Messiah to save them from punishment and death. They needed the Messiah to rescue them from their sin and restore the broken relationship between them and God. All of us need to do what the people on the road to Jerusalem did that day. We all need to cry out “Hosanna” ~ Lord Saves Us! But we need to cry out for salvation from Jesus knowing that He is the only way to be saved and that His salvation is forever. In John 14:6, Jesus said that He is ‘the way, the truth and the life’ and that ‘no one comes to the Father except through Him.’ Now that’s real salvation. Give each child a blank piece of paper provide markers or colored pencils. Encourage them to write the word majestic somewhere on the paper and then write or draw something to help them remember this attribute of God. You may want to encourage them to illustrate the memory verse or draw the story of Jesus’ triumphant entry into Jerusalem. Or, you could suggest that they draw palm branches all over their page and write various attributes of God on each of the branches as a reminder of all we should worship God for. After a few minutes, bring the group back together and give kids time to share what they have drawn or written. Pray that the kids in the group would come to know God more and more each week through this study and that they would remember that all of us are sinners who need to be saved and that they would turn to this good God for salvation. Pray that they would bow down before Jesus and cry out to Him to save Him from their sin. Filed Under: Lesson Plans, Matthew, Palm Sunday, What is God Like? Tony Kummer (Editor) reviewed & updated this page on : March 28, 2019 at 10:32 pm. All our content is peer reviewed by our readers, simply leave a comment on any post suggest an update.